Perhaps the most famous Pacific fleet squadron, and definately the one with the most recognisable insignia, was VF-111. The original Sundowners were established at NAS North Island on the 10th of October 1942 as VF-11. While at NAS Maui, for training prior to deploying into combat, the famous insignia was designed. 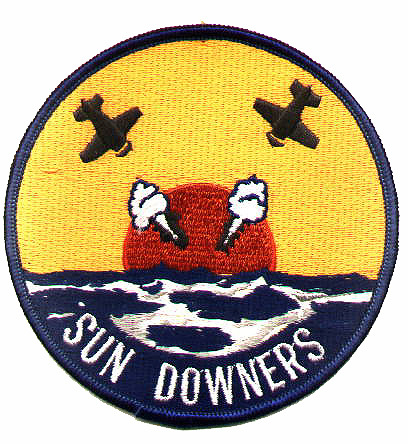 Depicting two Corsairs shooting a "rising sun" into the ocean, it was stencilled onto each one of the units' F4F-4 Wildcats, along with the legend "Sundowner" (numerals were not allowed upon unit insignia at that time). After a successful campaign during WWII VF-11 were redesignated as VF-111 in spring of 1948. A member of VF-111 scored the first jet kill in aviation history by downing a North Korean MiG-15 in the early days of the Korean War. The original VF-111 was disestablished on the 19th of January 1959. The next day, however, saw VA-156 redesignated as VF-111, thus continuing the Sundowner tradition, but not the unit lineage. VA-156 had itself been in existence since the 4th of June 1956 and quickly rose to the challenge of continuing the traditions of VF-111. The late 1950's and 60's saw VF-111 flying a variety of equipment, including the F9F-6 Cougar, FJ-3 Fury, F-11 Tiger and F-8 Crusader. By the 1960's the USA was becoming more and more involved in the Vietnam war and VF-111 made seven combat cruises during this period. The 1967-68 cruise saw VF-111 add another kill to its tally, the 19th Crusader kill of the War. However in 1971 the famous Crusader finally bowed out, its replacement being the then ubiquitous F-4 Phantom II. Late in 1971 the Sundowners yet again claimed an enemy kill, this time a MiG-17. After the War VF-111 continued its pattern of periodic deployments until 1978 and in October of that year they received their first F-14A Tomcat. The Sundowners' first two deployments were both onboard USS Kitty Hawk (CV-63), the second of these being extended so that Kitty Hawk and CVW-15 could take part in unsuccessful efforts to rescue the 55 American hostages being held in Iran at that time. The next cruise saw the whole of CVW-15 shift to the then brand new USS Carl Vinson (CVN-70) for its maiden around the world cruise. The deployment lasted from May to October 1983 and during this time VF-111 accumulated 1400 traps and 3000 flight hours. After returning from this cruise VF-111 gained TARPS capability for its F-14's, continuing this role till disestablishment. Another deployment onboard Carl Vinson (also known as "Starship Vinson") occured over the winter of 1986-87. During this six month cruise the squadron had three weeks of operating in the arduous Bering Sea. Returning from this cruise VF-111 began to train for their June 1988 western Pacific/Indian Ocean cruise. The end of this work up period saw the squadron back onboard Carl Vinson, when, for the first time since WWII, a carrier and battleship (USS New Jersey, BB-60) operated together as a battle fleet. The deployment itself began in June of 1988 and included exercises with the air forces of Japan, Thailand & Malaysia, as well as USAF Alaskan Air Command. The battle group also supported US forces protecting tankers transiting the Arabian Gulf and once again moved through the Bering Sea, making four transits of this area in four deployments. A short deployment to USS Carl Vinson occurred between September and November 1989 while the carrier and onboard squadrons took part in PACEX 89. This was the largest naval exercise since WWII and saw operations in the Sea of Japan, the Pacific Ocean and the Bering Sea. The 1990 cruise began in early February and ended upon the 29th of July. Once again it was a busy time for VF-111 as they took part in Team Spirit 1990 in the Sea of Japan, a battle group evaluation near Hawaii and ACM exercises with VC-5, then based at Cubi Point in the Philipines. The deployment then continued into the Indian Ocean and the Arabian Sea, including a weapons week while off Diego Garcia. Until December 1991 VF-111 (as with VF-51) were scheduled to become the first deployable units to operate the F-14D Super Tomcat, but in the end the honour went to VF-11 and VF-31. I believe VF-111 continued to deploy onboard the USS Kitty Hawk after this date until its unfortunate disestablishment in March 1995. At this point VF-111 had been using air-to-ground munitions for several years, mainly of the unguided variety. VF-111's markings have at times been the most flambouyant of the F-14 community, featuring several different forms of sunburst markings. Originally these were in full colour red and white, but as low-vis crept into Navy camoflage most of the aircraft received toned down grey versions of the markings. But one aircraft that was most definately not low-vis was VF-111's CAG bird "Miss Molly". This was a specially painted aircraft featuring noseart in addition to full colour markings. Another of Torsten's fine side profiles shows the scheme below.